Click the button below to add the D. Rickert ATA Flight/Touring Cases (Custom-Made to Fit) to your wish list. We now offer what are commonly called ATA-certified flight cases. ATA stands for Air Transport Association of America, the trade association for the major U.S. airlines. The organization is now called Airlines for America, so “ATA” is actually an anachronism. 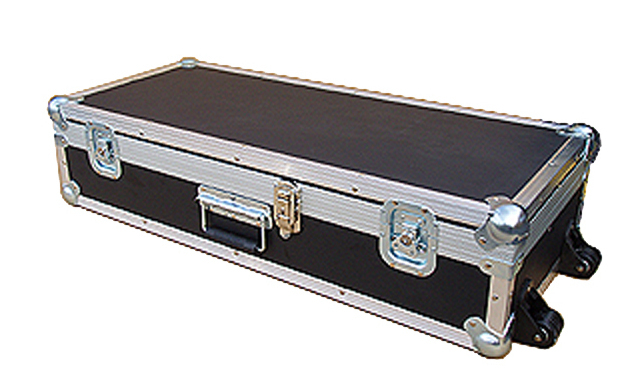 Anyway, a flight case, also known as a “touring case” or “Anvil case”, is designed to protect a wide variety of fragile items, including camera equipment, sound boards, keyboard instruments, guitars, and the like—and, yes, violins and violas! A typical ATA flight case looks like the image below. These cases are generally custom-made to fit a specific musical instrument or piece of equipment. They are very strong and provide incredible protection from crushing and shock, as well as thermal protection. After all, they are made for the cargo holds of planes, trucks, vans, etc. The typical unloaded weight for this type of case for a violin is in the neighborhood of 22 lbs. These are NOT the kind of case one would typically carry around town, or on a train or subway! While flight cases can be made to fit, say, a fiddle, bows and accessories, we recommend that a flight case for a violin-size instrument be made to fit the whole deal (violin, bow and accessories) in its regular violin case—in other words, a case inside a case, as it were. Think about it—what are you going to do with an empty violin case when traveling with your instrument safely in a flight case down in the cargo bay? If you are wondering whether or not you should seriously consider a flight case, see the section, International Air Travel with a Musical Instrument, below. Our heavy-duty ATA cases are made to take any punishment that baggage handlers can inflict and will definitely survive the dreaded cargo bay. Cases are constructed of 1/4" plywood with thick plastic laminate on the outside and a die cut foam inside. The cases are assembled with heavy gauge aluminum extrusions machine split-riveted throughout and the corners are protected by heavy gauge steel ball corners. All catches are spring loaded and recessed into the cases for strength and shear resistance. There are heavy-duty barrel dolly wheels mounted to the end of the case for easy rolling. Prices start at about $600. If you are interested, please contact us to discuss your needs. If you think that you do not need a flight case—think twice! If any of the following applies to you, you will want to reconsider. You will be fine on the U.S. end, but this is only because U.S. law requires airlines to accommodate musicians carrying their instruments; not the kindness and generosity of the airlines! (see the FAA Air Transportation Modernization and Safety Improvement Act of 2012, Section 713). It is getting back to U.S. that could be a problem. Most non-U.S. airlines, especially European airlines, explicitly prohibit carry-on baggage exceeding 22” in length. Sure, many musicians, either through their negotiating skills, charm or even sneakiness, manage to carry their instruments on flights out of Europe. But, then again, many have learned the hard way that they could end up buying seat for their instrument, checking it in, or even having to ship it back to the U.S. If you are up for the gamble, go for it. If you are flying on a smallish plane (<50 seats), there is a pretty good chance that have to check your musical instrument to be stowed in the cargo bay. If you are flying on a very small plane (<20 seats), it is a virtual certainty. This is true anywhere in the world, even the U.S. If you do have to check-in your instrument for the cargo hold, we consider the use of a ATA Flight case to be essential. Regular instrument cases are simply not designed for the rough treatment, temperature and pressure changes to which checked baggage is subjected. They are simply no match for the dreaded cargo hold. When using a regular case, even if the instrument is not damaged, you can pretty much count on the sound post falling out of place.